A few weeks ago, my friend Kate woke up only to discover swollen, pink-colored bumps extended along her arms, and unfortunately, she couldn’t stop scratching them! Kate was frustrated and understandably so. She wanted to get rid of hives fast. I told her that it sounded like a classic case of hives—or what the fancy medical books call urticaria. This is an extremely common allergic condition and it’s estimated that about 15%–20% of the U.S. population have had hives at some point during their lives. Hives are a very interesting reaction, since they can come and go over a 24-hour period. For instance, a hives outbreak may last several hours, disappear, and another reaction will occur somewhere else on the body. After the hives disappear, your skin will likely look normal. It is important to understand the cause of your hives. Kate’s hives outbreaks have been occurring twice a day for the past six weeks. This is called acute hives. Unfortunately, pinpointing the exact cause of hives is often not easy since the cause is often not found in 50%–80% of all cases. Food allergies: The most common allergic triggers among foods include fish, shellfish, eggs, cheese, berries, tomatoes, and nuts. The release of histamine is responsible for allergic reactions. Environmental allergies: Pollen, dust mites, and chemicals can trigger a hives reaction. Immediate reactions: A reaction can occur when a particular substance like latex directly contacts the skin. Insect stings can also trigger an immediate hives reaction. Infections: Several types of infections can trigger hives, including the common cold, hepatitis B, human immunodeficiency virus (HIV), candida, and viral infections of the upper respiratory tract. Drugs: Some medications implicated in a hives reaction include non-steroidal anti-inflammatory drugs (NSAIDs), opiates, and antibiotics like penicillin, sulfonamides, and salicylates. People with less frequent hives outbreaks are categorized as having recurrent hives, and it can be acute or chronic hives. By contrast, chronic hives will last longer than six weeks. Chronic hives can also be caused from infections, drugs, foods, and other allergies. On the other hand, there may be other secondary causes of a chronic hives case. 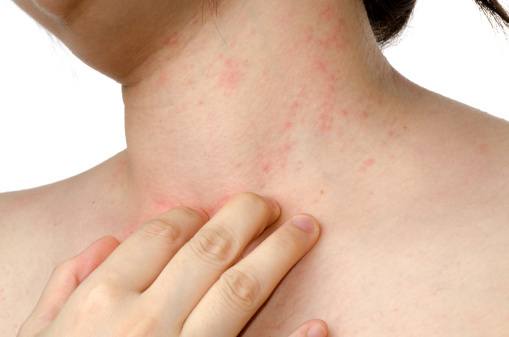 Autoimmune diseases: Chronic hives are considered an autoimmune disease itself, and other autoimmune diseases are linked with hives, including thyroid disorders, rheumatoid arthritis, and lupus. Dermatographism: Dermatographic hives can also trigger hive formation when pressure is applied to the skin. The pressure may include contact with another human being, towels, furniture, bracelets, or watchbands. Dermatographic hive lesions will often begin one to two minutes following contact with general redness being the first symptom; a welt will begin to show three to five minutes later. Cholinergic hives: Cholinergic hives are also known as heat-reflex. These are physical hives triggered by physical exercise, overheating, and emotional stress. Other triggers include eating hot spices, drinking alcoholic beverages, or taking a warm sauna or bath. The lesion will often show two to 10 minutes after triggered, and it will last for 30 to 50 minutes. Cold hives: Cold hives is exactly how it sounds. It occurs when you come into contact with cold water, air, or objects. The lesions will form where skin is exposed, and they will develop a few seconds to minutes after the cold is removed and the skin begins to rewarm. Accompanying symptoms may include headaches, dizziness, nausea, rapid heartbeat, vomiting, muscle pain, wheezing, shortness of breath, and unconsciousness. The annoying, itchy red bumps on Kate’s arms were downright uncomfortable. When you experience hives, the best thing to do is make some diet changes since hives could be triggered by foods high in histamine. Foods rich in histamine include avocados, fermented drinks, processed meats, tomatoes, spinach, vinegar, yeast extract, yogurt, vinegar, sour cream, sauerkraut, jams, fish, and certain cheeses, such as cheddar or gouda. An elimination diet can also help you determine your food allergies. Quercetin is a bioflavonoid that can be found in supplement form. It is also found in many foods, such as onions, apples, brassica vegetables, and citrus fruit. The anti-inflammatory effects of quercetin will inhibit the release and production of histamine and other allergic mediators from basophils and mast cells. High doses of vitamin C are thought to help with hives by reducing the effects of histamine. Vitamin C will prevent histamine secretion by white blood cells, and it is responsible for enhancing histamine detoxification. A dosage of 2,000 milligrams (mg) daily is recommended to produce the best effects. If diarrhea occurs, it is a good idea to reduce the dosage. Witch hazel is considered an effective astringent that can decrease the irritation and burning associated with hives. Witch hazel is thought to shrink the blood vessels in the skin. In turn, the body limits the amount of histamine that is released. When you apply the witch hazel to your skin, leave it on the skin for a few minutes. Afterwards, you can wash it off or leave it on. The combination of witch hazel and aloe vera gel may also help reduce the itching. Studies suggest that butterbur (Perasites hybridus) can decrease histamine and leukotriene levels in the blood. In a 2002 study published in the journal BMJ, researchers found that the effects of butterbur were similar to those of the antihistamine drug cetirizine in 125 patients with seasonal allergic rhinitis. It is estimated that around 20 homeopathic remedies are useful in the treatment of hives. Apis mellifica is a specific remedy that is effective for swelling and itching related to hives. Other homeopathic remedies often used to get rid of hives fast include arsenicum, dulcamara, pulsatilla, rhus toxicodendron, sepia, urtica urens, histaminum, silicea, and kali carbonicum. 1. Herbal teas: Some top teas with antihistamine and hypoallergenic properties include goldenseal, green tea, chamomile, and devil’s claw. 2. Aloe vera: Aloe vera gel is another way to relieve itching and redness from hives. Use aloe vera gel for immediate soothing and temporary relief. 3. Other herbs: Stinging nettle, basil, burdock root, milk thistle, coltsfoot, grape seed extract, sarsaparilla, red alder bark, licorice root, valerian, peppermint, ginkgo biloba, and pine bark extract are also used to treat hives. 4. Other supplements: Other supplements that can treat hives naturally include vitamin B12, fish oils, magnesium, vitamin D3, and apple cider vinegar. 5. An oatmeal bath is another great way to get rid of hives quickly. You will want to rub uncooked oatmeal and baking soda on your affected hives outbreak. 6. Acupuncture, reflexology, hydrotherapy, and aromatherapy are other ways to get rid of hives fast. McKoy, K., “Hives,” MSD Manual Consumer Version web site; http://www.msdmanuals.com/home/skin-disorders/itching-and-dermatitis/hives, last accessed September 3, 2015.